At first glance Oct. 31, popularly known as Halloween, would seem an unusual date for Archbishop Charles Chaput to meet with more than 3,500 Catholic school educators including approximately 2,600 Catholic teachers and administrators, mostly drawn from the Archdiocese of Philadelphia’s 122 elementary schools, 17 high schools and four schools of special education at the Pennsylvania Convention Center. 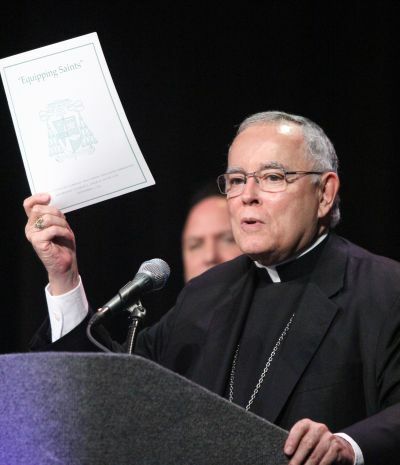 At this first “Archbishop’s Day for Teachers and Administrators,” Archbishop Chaput thanked the teachers for the good work they were doing for the students and their families. He noted at the beginning of his 26 years as a bishop his diocese was Rapid City, South Dakota, where there were only four Catholic schools and he knew most of the teachers. In Denver, which is larger, he still knew many of the teachers, but in Philadelphia the school system is so large it is impossible to get to know everyone personally. “Help me to learn in some way what you are like,” he exhorted. The archbishop’s comments were part of his homily at the Mass that opened the meeting with the educators, and he also drew a lesson for them from the day’s Gospel reading taken from St. Luke, in which Jesus preached at a dinner given by one of the leading Pharisees. Jesus, the archbishop explained, “was a rabbi. He held a sacred office in the context of Judaism to be a teacher, to be an instrument through which God passes his wisdom to the next generation. “The children in your classroom, whether it be elementary school or high school, in some sense are sitting at your feet in the same way the apostles and scribes and the Pharisees in today’s Gospel were sitting at the feet of Jesus,” he said. The archbishop’s Mass was followed by remarks from Chris Mominey, the archdiocesan chief operating officer and secretary for Catholic education. 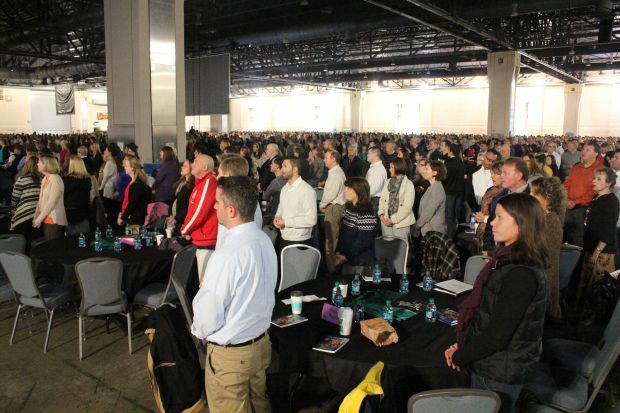 During his presentation on Mission, Vision and Virtues he enunciated six foundational principles to create a new culture into the future — Respect, Integrity, Enthusiasm, Collaboration, Innovation and Excellence — doing so in a manner that was a perfect example of his own practice of the third principle. Following this was a lecture in two parts by Jesuit Father Robert Spitzer, president and founder of the California-based Magis Center for Reason and Faith and a nationally known speaker, writer and debater on the issue of compatibility between religion and science. “There is no contradiction between faith and science,” he said. An example he used was based on the Big Bang theory through which most scientists now agree with almost certainty that the entire universe came into being about 13 billion years ago through a gigantic explosion, and all matter is still speeding out from its center. Atheists argue that since we know how and when the universe was born it was not created by a God. Father Spitzer notes the Catholic Church does not disagree with the evidence of the probability of the Big Bang, but holds that the creation of the universe was through the intelligent design by God that it was put it into motion. He also points to the many committed Christians who made the scientific discoveries upon which atheists base their contention that there is no God. Not the least of these scientists cited by Spitzer was a Belgian priest, Msgr. Georges Lemaitre, a scientist and professor at the Catholic University of Leuven who in 1927 first proposed the universe is expanding at a constant rate and by measuring this rate of expansion one can mathematically come back to a fairly specific time it came into being — the basis for the Big Bang theory. Lemaitre and Catholic scientists who have followed saw no reason to believe establishing an age for the universe was proof that God does not exist. Earlier in the morning before the archbishop’s Mass, Donna Farrell, executive director of the September 2015 World Meeting of Families in Philadelphia which Pope Francis is expected to attend, made a presentation to the assembled teachers and administrators. She solicited their support and invited their participation for this historic coming event.